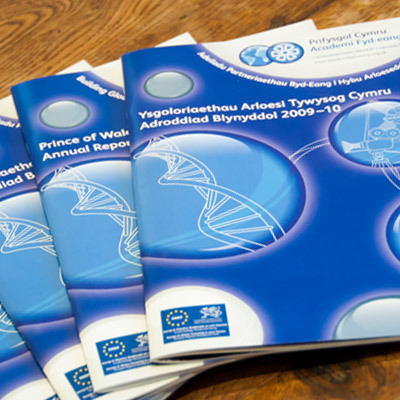 Global Academy was set up by the University of Wales with Prince Charles as patron for their Prince of Wales Innovation Scholarship programme (POWIS). The program recruited the brightest and best PhD students from around the world and brought them to work at Welsh companies in Reasearch & Development roles. In addition to their central office in Cardiff they also have an office in Silicon Valley, California. 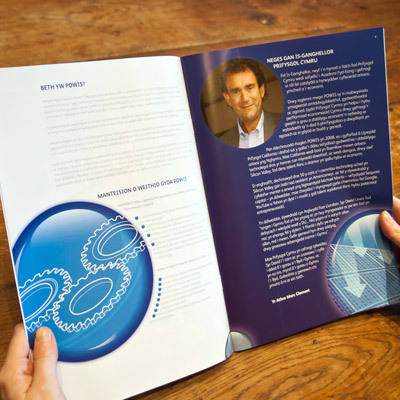 We designed very many marketing materials for the project, including banner designs (over 20), press ads, annual reports, interactive mailers, flyers and posters. Additionally Rhys was hired for several photoshoots, including a tough shoot at HRH Prince Charles' Welsh residence, a conference in Cardiff and at the Welsh Office in London (and a visit to the houses of Parliament). We developed a technical drawing line art style which was used across all designs. 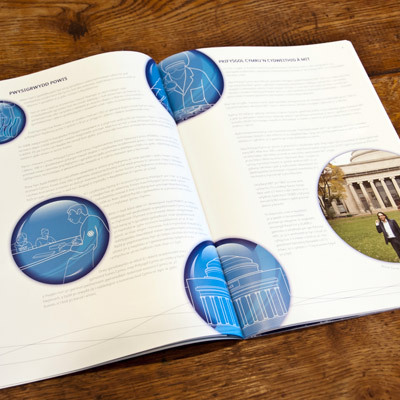 "Global Academy choose to work with Webber Design for a number of reasons. Most importantly they came up with the most creative and innovative ideas to reflect our brand messages. Secondly they are extremely competitive on price. Thirdly they often respond at very short notice and always deliver to deadlines." Glbal Academy annual report - in Welsh and English. 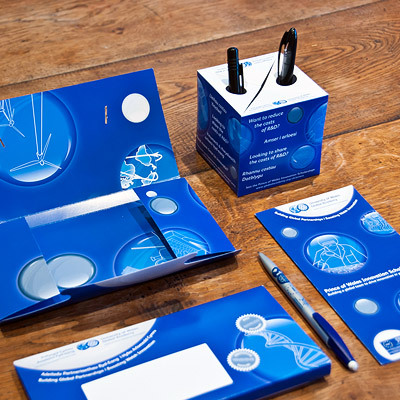 The client wanted some innovative way of communicating with potential new partners so we designed this interactive mailer which comprises a flyer, leaflet and branded pencil. The mailer comes flat packaged in a branded envelope and on opening jumps into the air forming a cube. The cube is a desk tidy. Two different press ads/posters which promoted the work of Global Academy both in the UK and overseas. 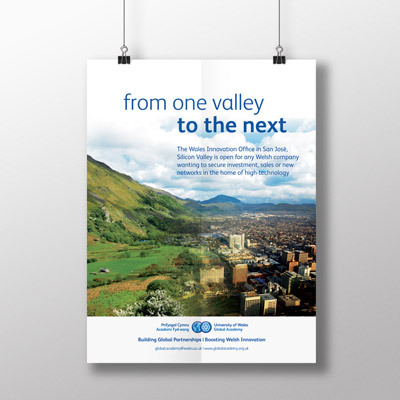 Both concepts for the posters were developed after the client presented us with their poster text. A selection of the icons we designed for the project, which were used throughout the marketing materials. 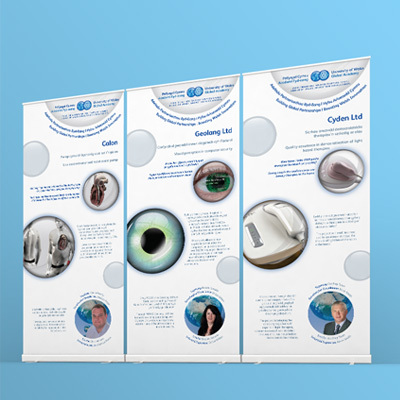 We designed over 25 banners for the various partner companies of the project. 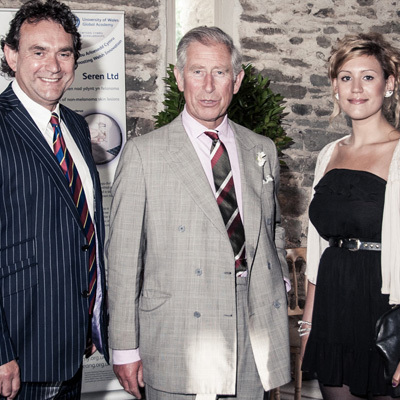 WD Rhys photographed HRH Prince Charles at his house in Llandovery, Wales (with Vice Chancellor of the University and his daughter). This was one of the hardest photoshoots ever due to the list of restrictions placed on Rhys by the Prince's staff ("don't talk to him, don't turn your back on him, don't touch him…").